All of the Three Munchkins fashions are created in my pet-free, smoke-free, sewing studio. Most styles are available in sizes 0-3 months- 5T, some up to size 8. Please see specific listing for availability and specifics. Quick download! Looking forward to sewing this style! Seller great to work with. Fast shipping. 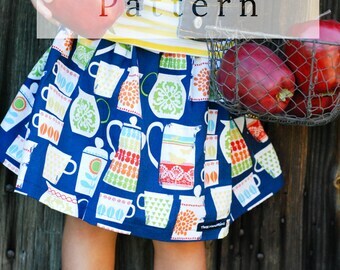 Love the skirts and attention to detail with matching up the chevron pattern at the seems. Can't wait for my daughters to wear them! I design classic silhouettes and create garments with only the finest fabrics. All of the Three Munchkins fashions are created in my pet-free, smoke-free, sewing studio. Most styles are available in sizes 0-3 month, 6 month, 9 month, 12 month, 18 month, 2T, 3T, 4T, and 5T. Please see specific items for all sizing details. I am always open to custom requests! If you are not happy with your product, I will provide a full refund, minus shipping expenses, upon return. My goal is for all customers to be 100% satisfied. If for any reason you are not 100% satisfied, please contact me and I will do what I can to make it right. I accept PayPal, checks, and money orders. I will delay shipment until your check has cleared. I will ship your item(s) with the United States Postal Service. Please let me know if you prefer another carrier.